The Merrell Wakefield has made its autumn winter debut. Lifesaving coat. That is all. It was last featured here and here and a few other times too but I won't bore you with too many old posts. What I love is it's got the shape and fit of a regular coat, with a flattering nipped in waist and it comes in neutral colours that don't fight with the rest of your wardrobe. However, unlike regular coats, you will not get wet wearing this. I've tested it rigorously...including at the now famous playgroup trip to the farm where it rained for the whole visit AND the bus broke down (not that the broken down bus tested the coat much - just my patience). For AW2012, the Wakefield's been rebranded as the Merrell Ellenwood - in case you're wondering why it's not widely available. I've listed some stockists of both the Wakefield and the Ellenwood at the bottom of this post as well as some pointers on buying one yourself. 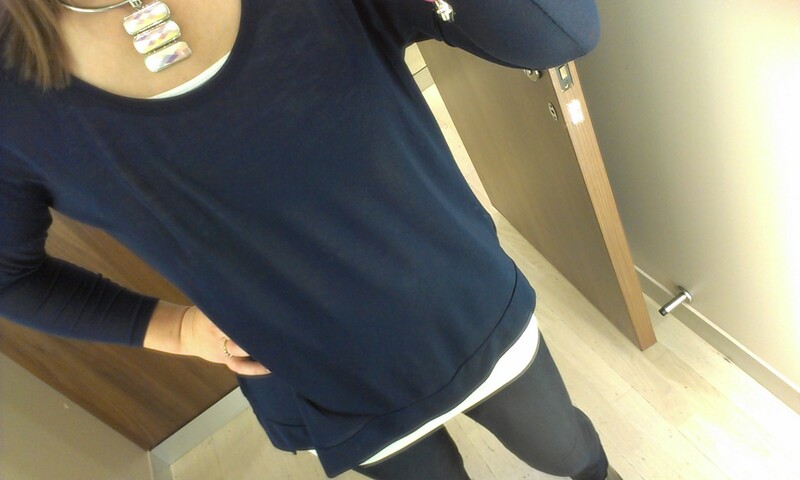 It's a simple outfit today in classic navy. I love this jersey top from DP's. It's loose in the body with tighter arms and is slightly sheer - perfect for this in-between weather, especially when wearing the insulated Merrell. My ankle boots are past season Clarks. I am strangely drawn to grey patent..
My necklace was a bargain from the Lisburn Road based vintage store, Jacob Street. The pendant is made from mother of pearl - a neutral stone that will work with lots of outfits, but it can be taken off, allowing the solid necklace part to be worn alone or with another pendant. Walking into Jacob Street, I was like a child in a toy shop but my kids were like bulls in a china shop so a revisit is on the cards...sans enfants..
Sizing: I wear a size 10 (S) in the insulated version. I'm a 10 on top and 12 on the bottom half. It's a perfect snug fit on me though I cannot wear a thick jumper underneath (but am not a jumper wearer anyway and it doesn't really need it in our climate). If you are larger in the bust or want to wear heavier knits, size up or consider the non-insulated version. 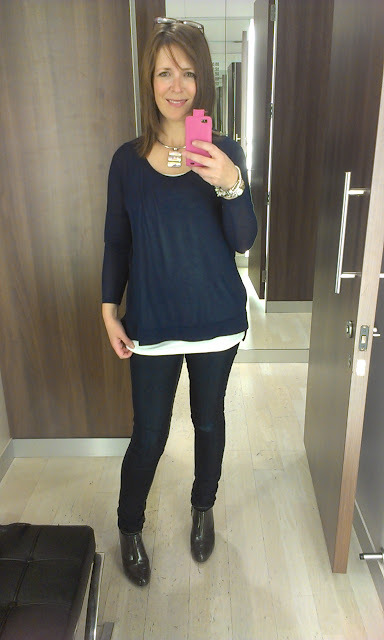 I really like the layering look! Your necklace is beautiful too! I love the Merrell coat and have just found the black version online for £79.97 on GoOutdoors website, bargain, but can only collect, no delivery! Adorable outfit ! 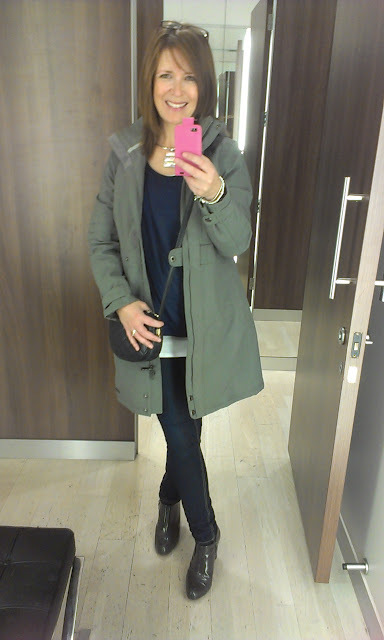 Loooove that coat so much ! I wore a coat very similar on Monday. Love the blue top. Nice look there (and I like your make up too!). I too bit the bullet last year and spent a lot of money on a similar styled Helly Hansen coat and it's great - not too bulky but warm and waterproof. Don't know how I managed before. You still look ten times better than I did yesterday and today. It is still bucketing it down! And you always manage a little accessory too. Something I must retrain myself to do. 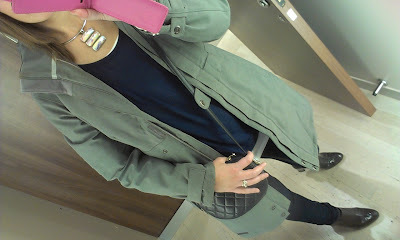 I am a fan of neutral color coats too,they go with everything !loved ur necklace! I am very tempted. Have been searching for a stylish waterproof jacket with a hood for ages and had pretty much given up. Have a Lands End down one for winter so the uninsulated one sounds great - living in the west of Scotland it rains all summer long and it is impossible to find something to wear with a hood that doesn't look like you are off ski-ing or hiking! Thanks for the tip. Had, of course, sworn off spending any more money at all but . . .
Nice outfit!! I really like that raincoat! Love the necklace - I never really knew what Jacob St sold ... perhaps I should stop one of these days instead of driving past wondering :) Your hair looking very good too - how about a blog on good hairdressers one day? I seriously struggle in Belfast to get a good haircut. I love the jacket and I love the necklace! It finally stopped raining here today! Hooray! Great necklace too. I was tempted to buy the Wakefield after one of your previous posts and this post gave me the push to look for one since my short North Face raincoat wasn't keeping me dry on the school run. I ended up ordering the uninsulated Ellenwood in the grey/green colour way from Black Leaf on Amazon, and absolutely love it. 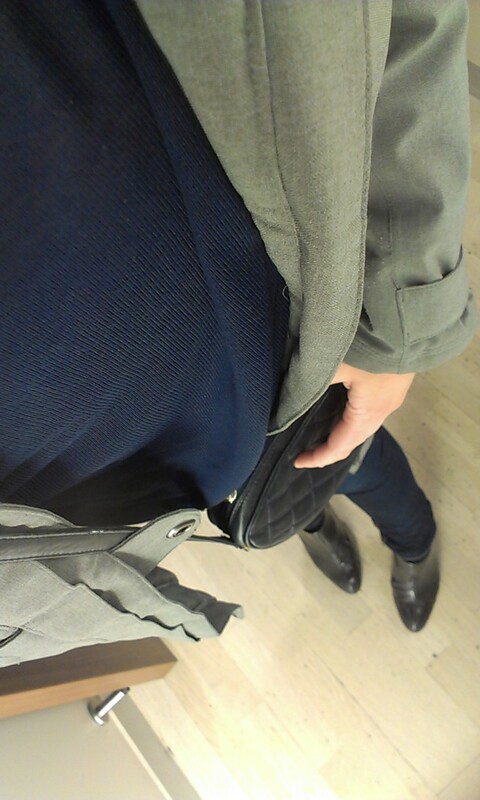 Have hardly worn my other coats and had lots of compliments. My only complaint is that the hood's too big for my small head and comes over my eyes so think I'll have to get it altered somehow, but it's a fab coat. Why don't buy the Merrell coat from Sports Direct? Turn Your Garden Into A Paradise Retreat With Topsoil! for some time, and all a rapid when i x'ed out my firefox and opened it again it wont visit websites, it wont even say page not displayed. it will just be blank. and so i unstalled it and re stalled it also it worked when it premiered from your reinstal but when i x'ed it out again and opened it showed blank. does anyone know how i can fix this??? ?.